My second project with LaCantina was a unique lake front house in Vermont. With stunning views, their folding door system really expanded our interior space onto the main deck without blocking the lake or mountain views. 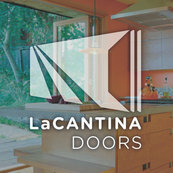 Because they have so many door operation styles, we were able to take care of all of our exterior door needs. This is important to keep consistency around the house. In total, we used their folding, sliding, swing, and french door systems. Their solid architectural bronze anodizing worked perfectly with out black clad windows.